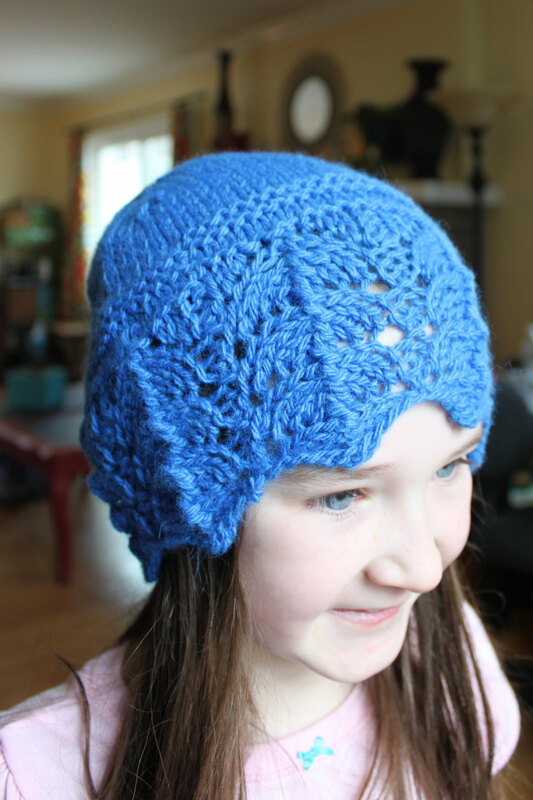 A few weeks ago I made my daughter this blue hat. I had only glanced at the lace chart and not at the instructions, and thus knitted the edge pattern incorrectly. I wasn’t unhappy with the result, but I wanted to do it again the right way, and plus I wanted a hat for myself out of it this time. I used some half-skeins of wool in my stash. 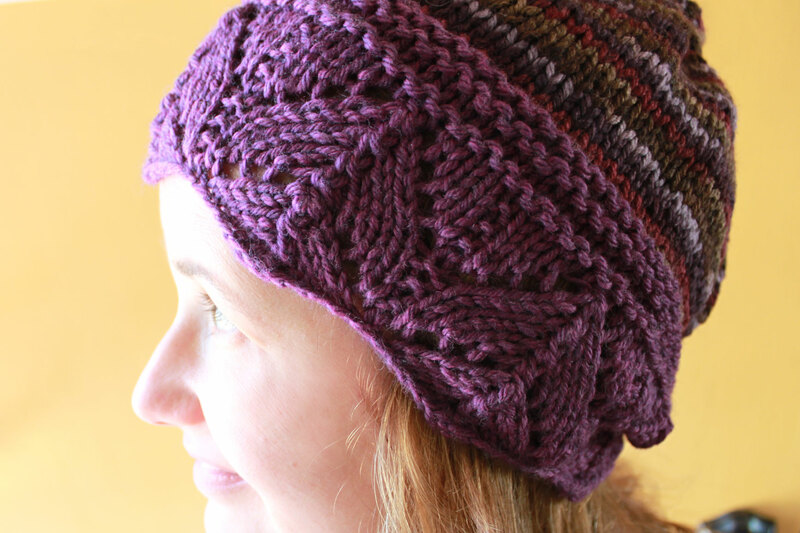 The pattern is the edge-of-lace hat in 101 Designer One-Skein Wonders. On my daughter’s hat I made decreases for the crown instead of following the pattern, but for my own I followed the pattern just to see how it would look because I’d never made a hat with sewn-off crown in that way before. Basically you just knit the hat as one big tube, then sew off the top and stitch all the corners together. I actually really liked the extra fullness this gave the top of the hat. It is more flattering on me, I think, than a more fitted cap. But lest you think this project went just as I wished, let me confess this: I also also knitted mitts based on the wrist-warmer pattern associated with the hat pattern, but they were too big, so I gave them to my neighbor! Now she has pretty mitts and I have a pretty hat and we must never wear them in the same place at the same time. I’ve had this project in my head for years but finally took the time to make it up this weekend. This is a sturdy canvas bag to keep in the back of my car. It’s filled with items to keep my kids occupied in waiting rooms, at a sibling’s soccer practice, during a long restaurant wait, or similar. It contains a set of high-quality wax crayons, a full set of colored pens, pretty coloring books (we like many of the Dover ones, including this one), learn-to-draw books, and blank book, and a book of games and puzzles. 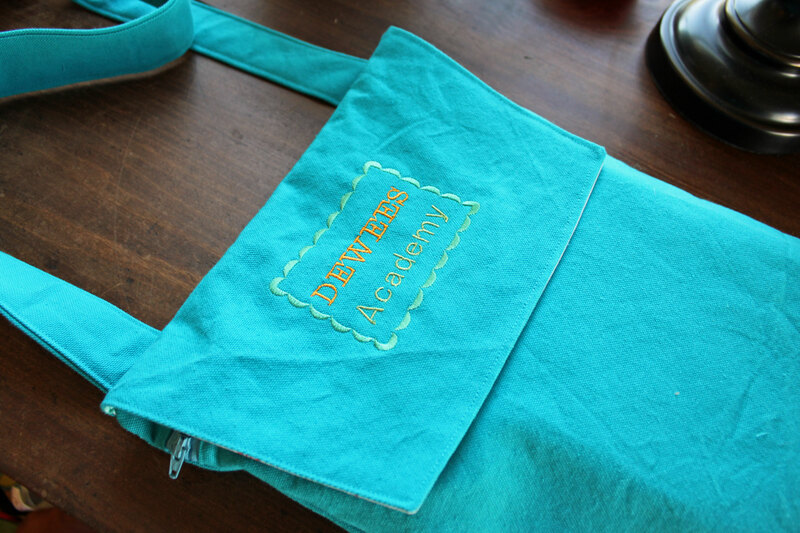 We don’t actually call our homeschool “DeWees Academy,” but it seemed like a cute thing to put on the outside of the bag. I put in a zipper closure so all the crayons don’t fall out. 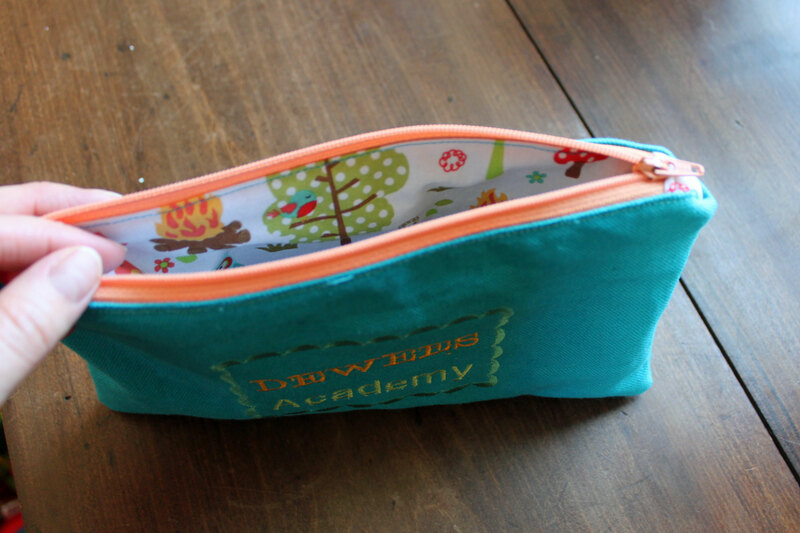 This little pencil case goes inside and holds the writing tools. This is another bag I made at the same sitting. 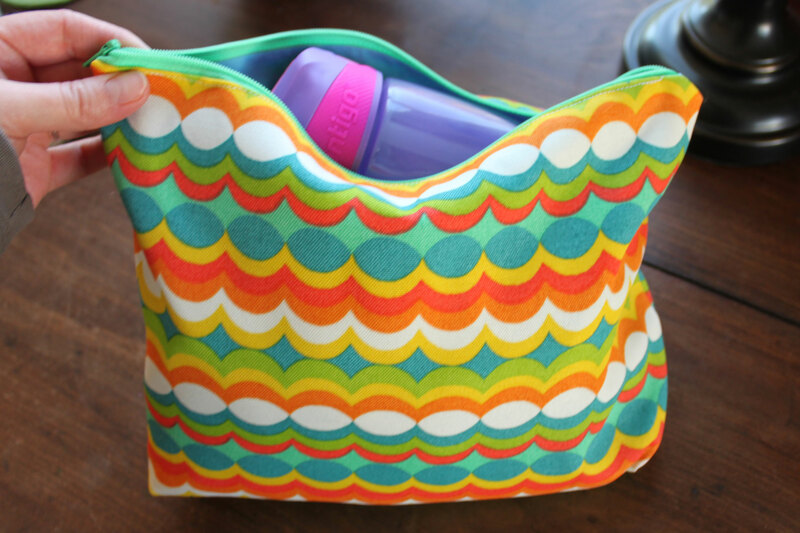 I don’t carry a diaper bag for Daphne, but have a large zippered pouch in my purse that holds all her necessary items. My previous pouch was unlined to keep the bulk in my purse to a minimum, but unfortunately that also made it flimsy, and it was falling apart. This new one is made from home dec scraps from another project and lined with a thrift-store sheet. Ever since I bought an assortment of colorful zippers from Amazon.com I make a lot more pouches! But new, handy little bags are always helpful. This one already has been. Dorothy has been living in filth. She’s a hoarder by nature, tucking baggies of rocks and shells and old toilet roll tubes away like squirrels do nuts for the winter. The difference is that squirrels eat all their nuts in the winter, but Dorothy’s room just gets more and more crowded with junk. Telling her to clean her room didn’t even help, because she wasn’t sure where to put baggies of rocks and old toilet paper tubes. I drove to IKEA right after Christmas to pick up some storage furniture to replace daintier but less useful pieces and enlisted her help getting organized. Fortunately, she got tired of helping after the first hour or so, so I got to spend all my “free” time for the better part of two weeks putting together furniture and throwing stuff away without her there to witness it. I’m sharing my after photos. She’s now one very organized 8-year-old, and my hope is that the new system will help her keep it that way. 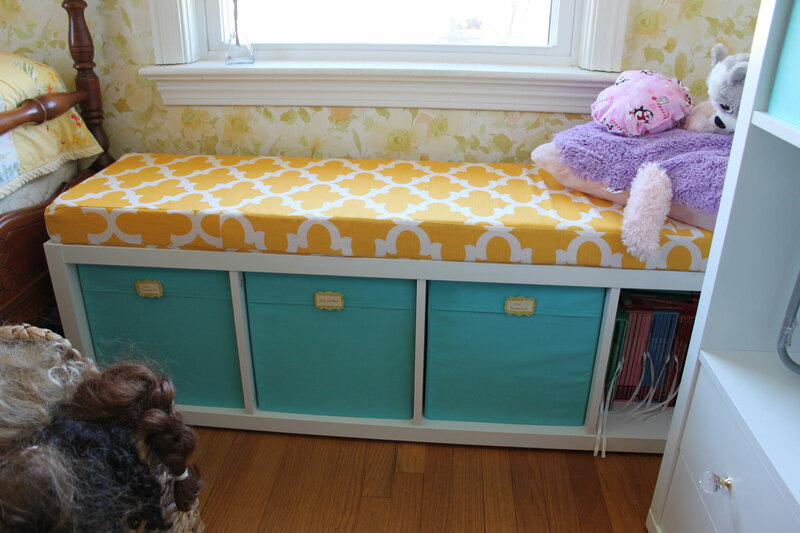 I bought 3-inch foam to make a seat on top of the shelf under her window. All her doll accessories are now tidily at hand. Don’t notice my measuring “oops” on the side of the seat cover! After spending that much time sorting through 3rd grade ephemera I apparently lost the ability to do simple math. 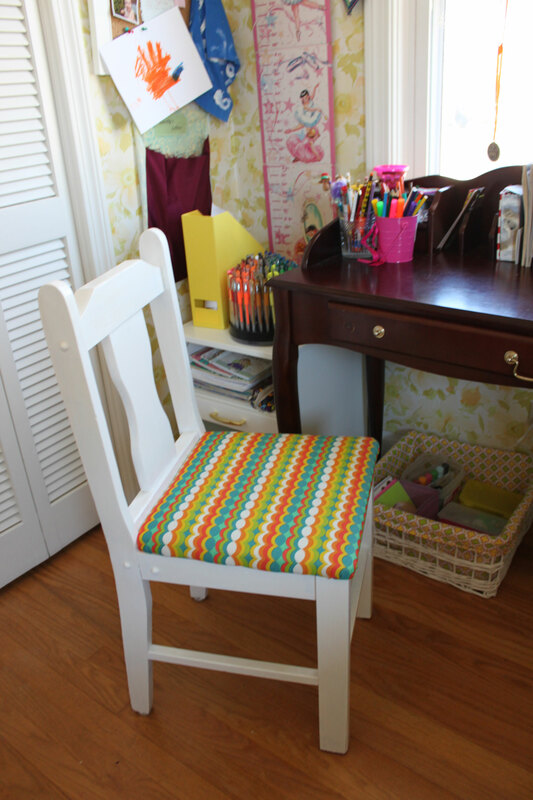 This chair was in her room before, but it got a coat of white paint and a new seat cover. On the wall behind her is a pouch she sewed herself to hold keepsake letters. This IKEA shelving unit got a little dressed up with pretty glass knobs on the cabinets and drawers. She painted the ruby slipper canvas at an art camp last summer. 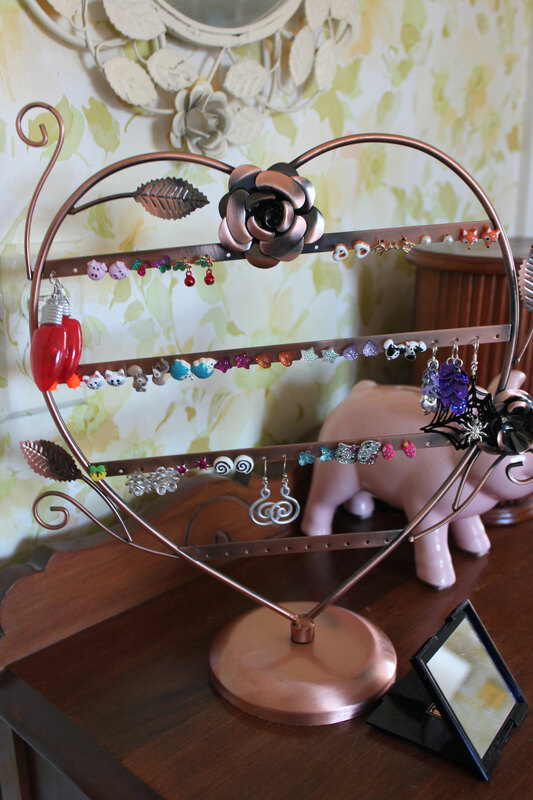 I found this earring tree on Amazon.com to keep all her ear candy organized. 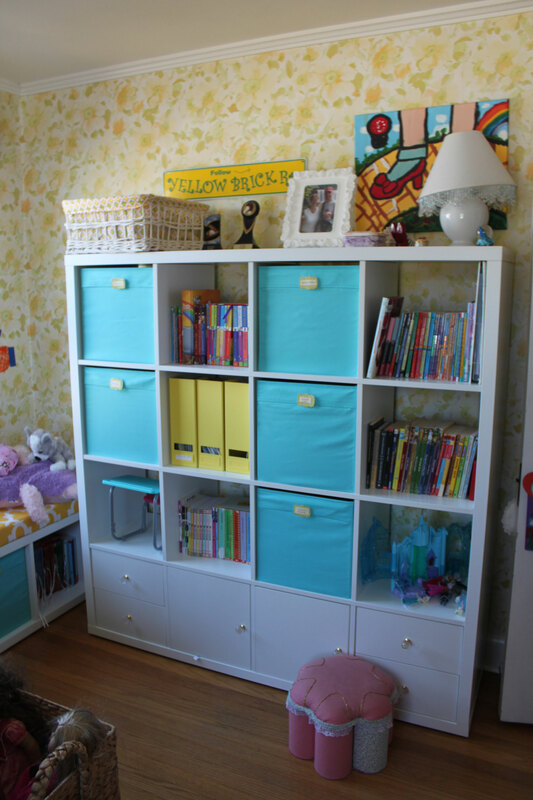 She had earrings crammed in boxes and baggies all over her room. We put some other pairs in ice cube trays in her top drawer. 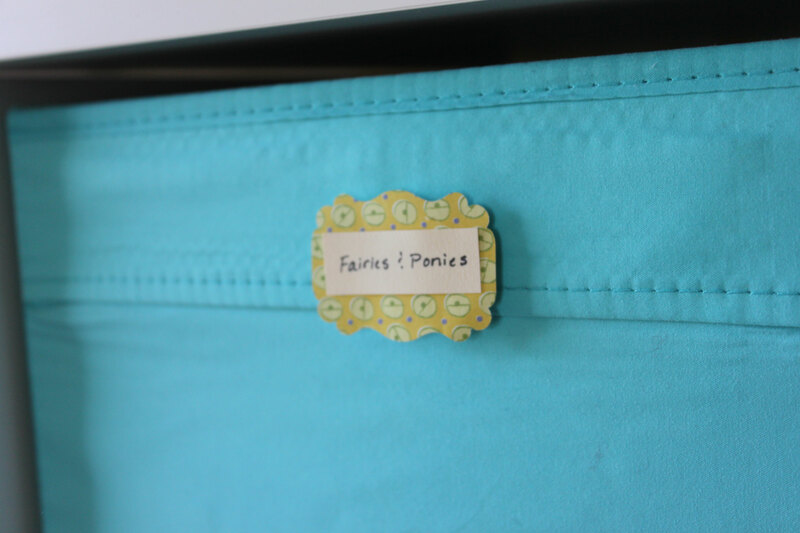 I made labels with a craft punch for all her bins. We use a velcro label system for toy bins all over our house. I staple hook tape to the bin, and glue the loop tape to the back of our labels. I keep a jar of the extra labels on hand for when we want to repurpose a bin. 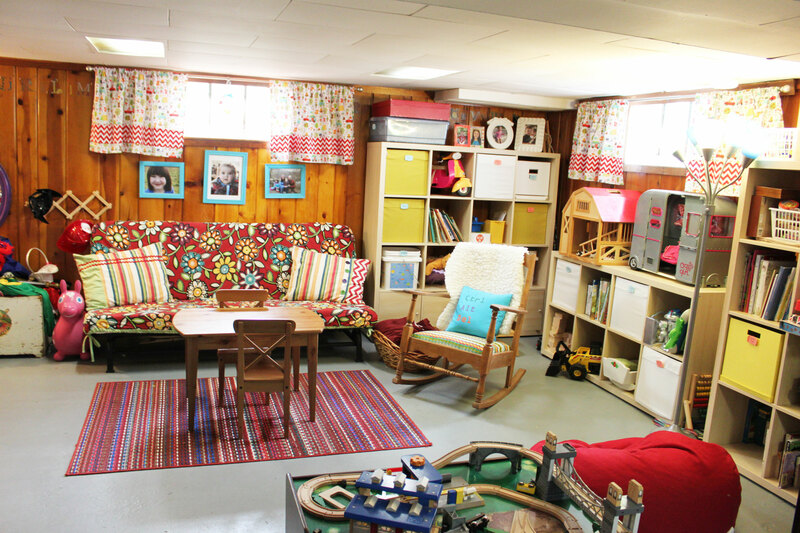 The bins can be exchanged for others in our playroom and in Worth and Daphne’s room when they want to rotate playthings. I bought a wall-mount lamp at IKEA and spray-painted it to match the room. Putting the lamp on the wall helped free up space on her desk and alleviated my long-standing worry that she’d knock it off and break it. Dorothy made the name banner hanging over her bed. Here’s a final view of her new window seat. I left her doll-clothes storage system of a ribbon strung in her window intact because it’s pretty and functional. 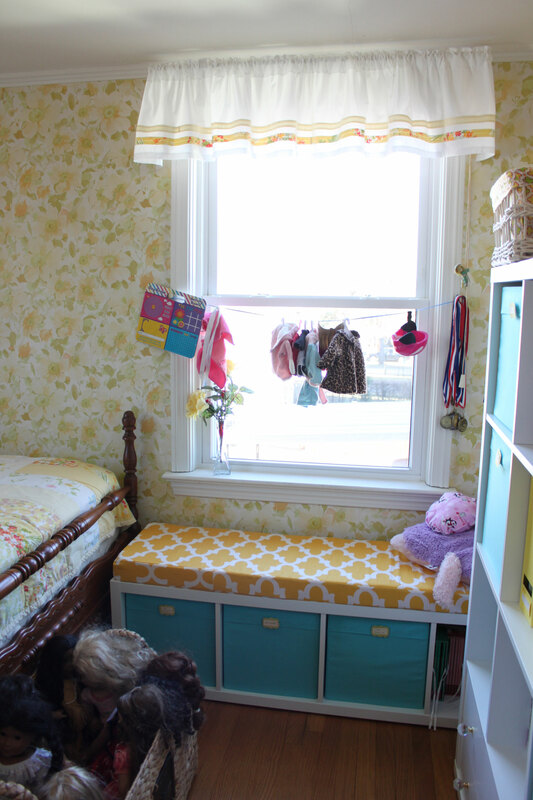 I think I’ve blogged about her quilt and curtains before. 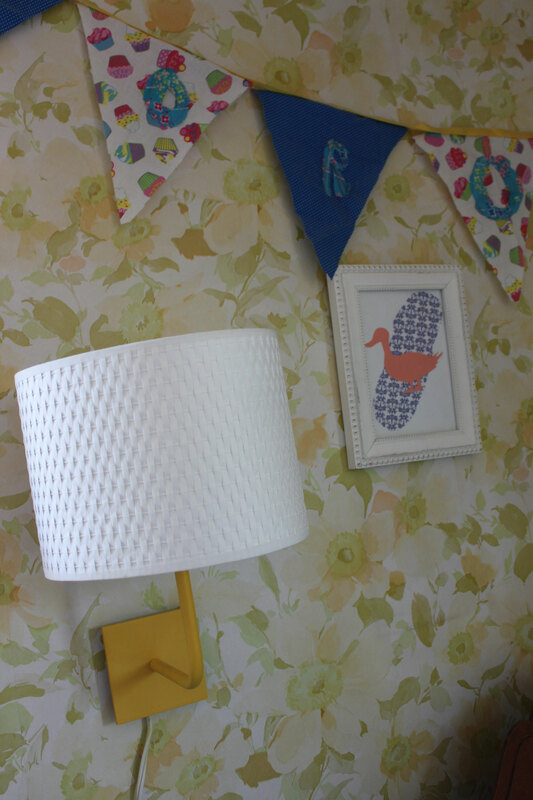 When we moved into this old house, Dorothy fell in love with the bedroom she now occupies and the specific wallpaper hanging on the walls. I removed wallpaper and repainted every other room in our house, but we’ve honored her wish to keep her vintage wallpaper. 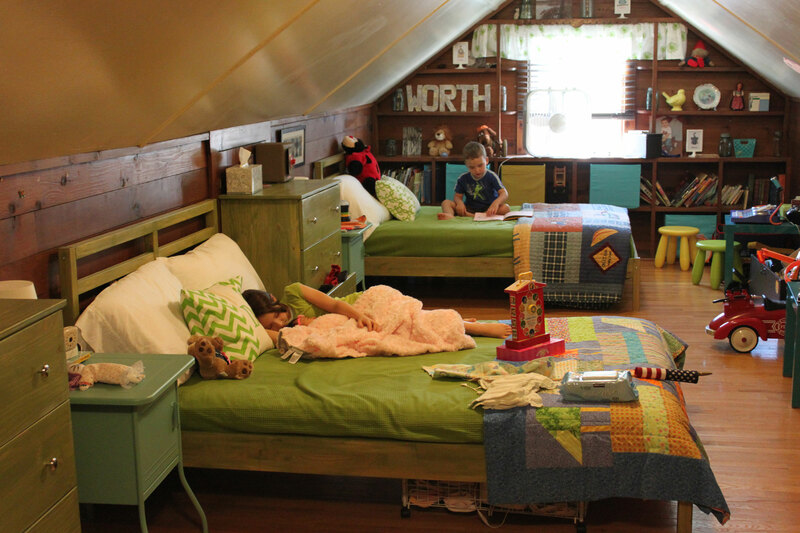 I collected old bedsheets in similar colors from thrift stores and made her quilt and curtains out of them. It’s made a sweet little-girl room, with a nice blend of old and new. I’ll probably flip out in a few weeks when she lets it get messy again, but I’m enjoying the view from the doorway in the meantime! Because of course, as soon as I was done with the job and turned the room back over to her all sparkly and clean, she shut the door and hasn’t welcomed any other family members in since. C’est la vie. This is my sewing space. It’s in the corner of our family room, to the side of the fireplace and not far from the sofa. It’s right in the middle of everything. If it gets messy, it shows. But if I have five minutes to sit down and start cutting something out, it’s right there. I don’t have to go to a separate part of the house, but can just float by and check in for a few minutes. My antique ironing board is tucked up against my Grandma’s old desk, in which I store threads and notions. The kitty litter bins under the table hold projects in progress. A little box on the table holds scissors, rulers, pencils, and the manuals to my sewing machines. The shelves hold buttons, patterns, pins, bobbins, and my knitting and crochet hooks. 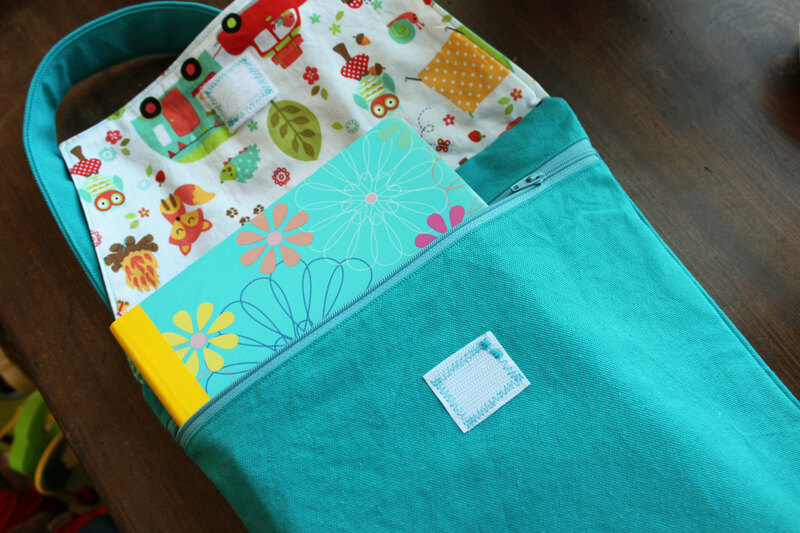 My embroidery machine sits on top of the little cart tucked in the side, which also holds pattern books and notions. 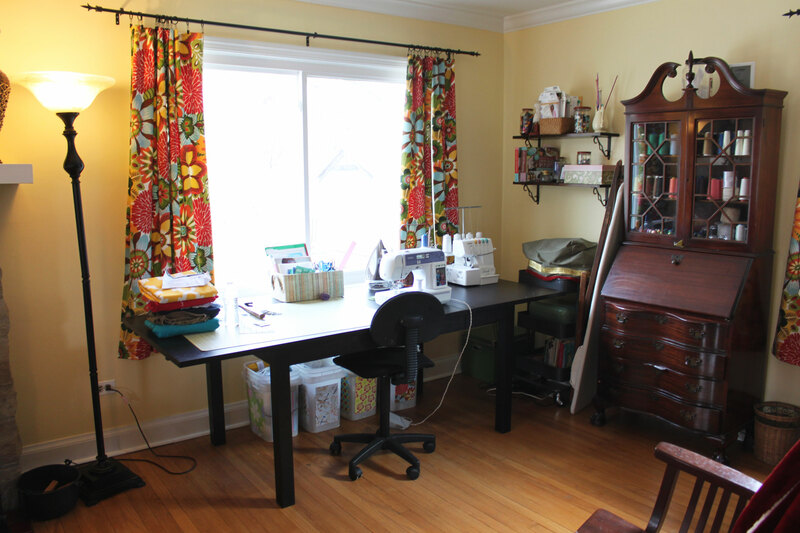 I love my sewing space and it is beckoning to me today! I have no cute, completed crafty projects to show. 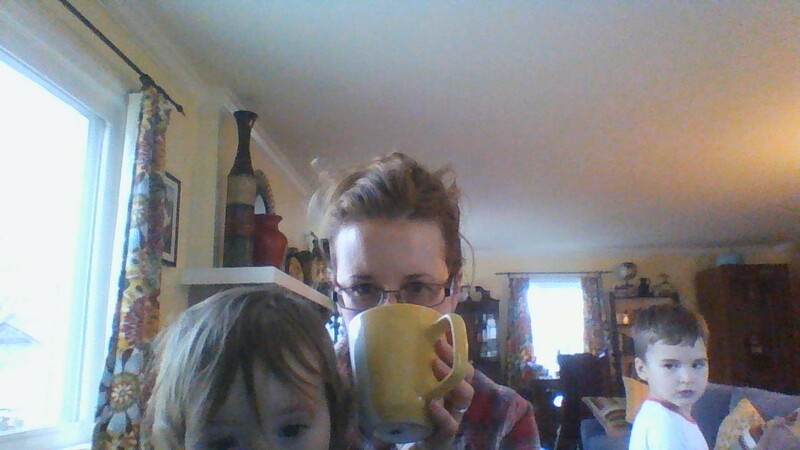 I have two small people with big colds, one baby with a double ear infection, a ponytail, and a ginormous mug of coffee. And I’m trying to finish the project, now in its second week, of transforming my 8-year-old’s bedroom from one of the circles of hell to a livable, organized space. I’ve carted out four huge bags full of trash. Seriously. May the craftiness be with you, and maybe later this week I’ll have time to look at your blogs and know that crafty life goes on! And melodrama. It always goes on. And homeschool math. It always goes on too, or at least it should if I get off the computer and go make it go on. Cheers! Dorothy got a new blue hat to start out this chilly January. It was really supposed to be my hat, but sometimes that happens. The yarn is a delicious, wonderful, hand-spun, hand-dyed wool from Block Island, Rhode Island. A friend sent it as a souvenir of her trip. 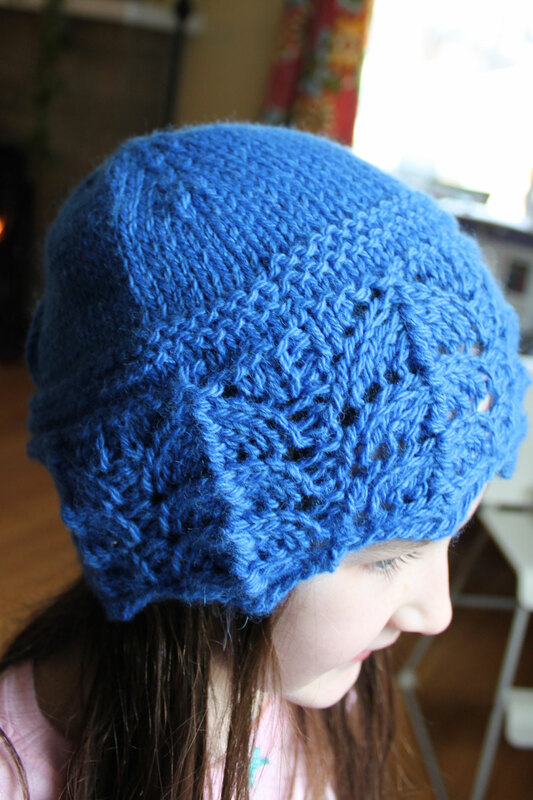 I’ve held on to it for six months while I waited for the right inspiration to hit, and when I came across the edge of lace hat pattern in 101 Designer One-Skein Wonders I decided that would be it. I got a new black coat for Christmas, and I thought the pop of bright blue was just what it needed. The first problem with my execution of this plan was that I only read the first line of the pattern, which says to do the eight lines of the lace pattern twice. And I followed the lace chart completely through–twice. The edge was pretty, but not a bit like the photo I’d been drawn to in the book. I looked more closely. I was supposed to have put a straight knitted row in between every row of the lace chart, and the chart itself represented two repeats of the pattern. Oops. So my lace is unique. That didn’t bother me so much given that what I ended up with was still pretty, but my blue-eyed Dorothy had been watching me knit this and thought it was so nice, and then when I tried it on the color wasn’t very good for me. It made my autumn colors and green eyes look sickly, which is never the look I’m going for. Then I popped it on my daughter’s head and it was gorgeous. The blue is just the right color for her eyes and porcelain skin. So there you go, a hat for Dorothy. I have some heathery purple yarn left over from some other projects and I think I may try the hat again in those colors for myself. And I’ll enjoy my handiwork in a place I can see it better, on the head of my oldest! We’ve had such a fun, jam-packed, busy holiday break we’re going to take another week off. This relaxed Monday morning (the first relaxed morning in weeks, it seems) feels like a great time to be a homeschool mother. While I’ve been socializing and gift-exchanging and catching up with friends I’ve also been doing some knitting this break. I saw this Vite Cowl pattern on a friend’s Pinterest page and decided to work it up for myself. I had a little trouble settling into the pattern, and pulled out and re-started the first leaf three times, but once I completed the first repeat the rest of it went very quickly. I used KnitPicks’ Brava Bulky yarn, which is a very inexpensive, soft, versatile acrylic I stock in a variety of colors for my kids to use on art projects. I had accidentally purchased an extra skein of Pea Pod, so it was on hand. 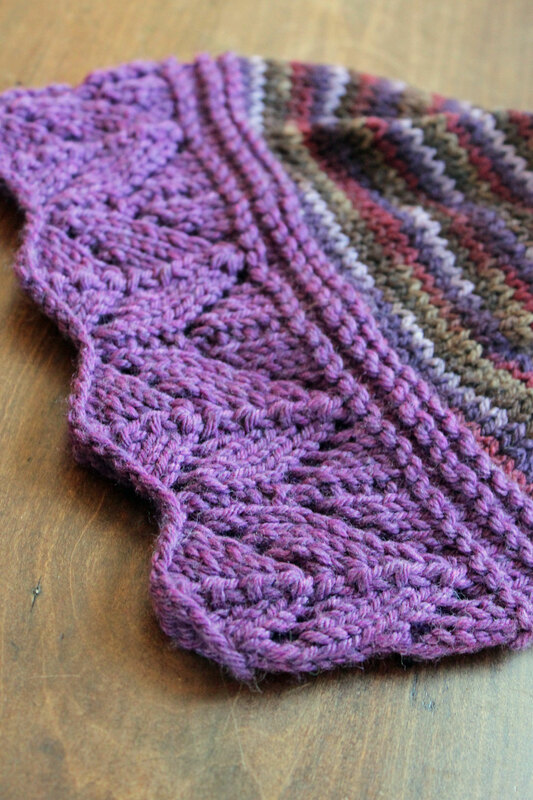 It seemed like a win-win when I decided to use it for the pattern because I’d use up some extra yarn and spend nothing on a little fun project for myself, but now that it’s finished I wish I’d gone ahead and bought a nicer yarn with more body. 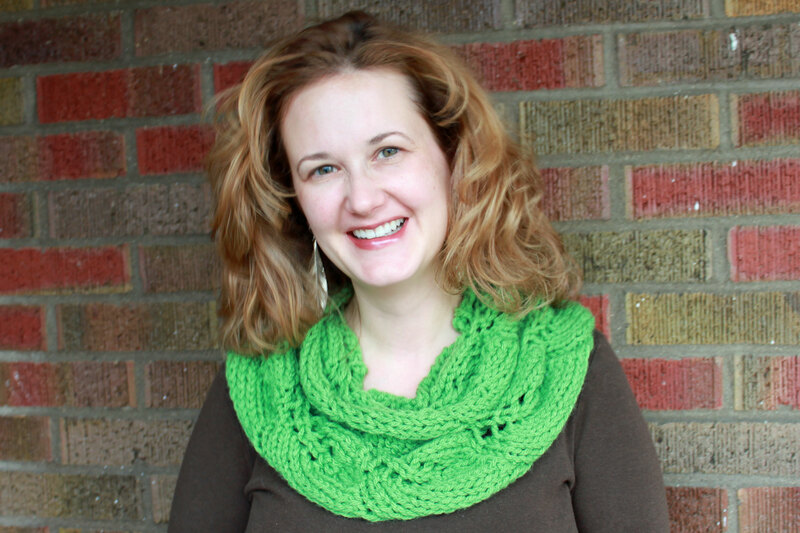 This yarn is so soft and drapey that the cowl wants to sag down in front and lose stitch definition. There is no point in knitting leaves if they don’t show up. All the same, it’s a pretty green scarf either way, and a bright, cheery, and warm way to start January.